All climbers should be aware of the elements of risk associated with climbing on Mt. Hood. While some dangers are more likely to occur during particular seasons it’s important to be familiar with each type and how to avoid, prevent, or mitigate the risk associated. Rock / ice fall occurs when surfaces holding rock, dirt, ice, or snow in place are unable to hold their current formation and begin tumbling down the mountain. This can be due to the warmth of the sun, strong wind, or vibrations from the earth or other climbers. The Cascades are mostly composed of rotten rock piles loosely held together by snow, ice or convenience – in other words, don’t consider the ground beneath the snow and ice to be solid. When is it likely to occur? Rock fall is most common in the Summer and Fall. Ice fall is most common in the Winter and Spring. Get an alpine start (anytime between 12 – 2 am). Starting early will help you get up and down the mountain before the sun comes out and the rock / ice fall danger increases. Always wear a helmet on the upper slopes of the mountain. A crevasse is a deep, open crack that can occur in large glaciers. 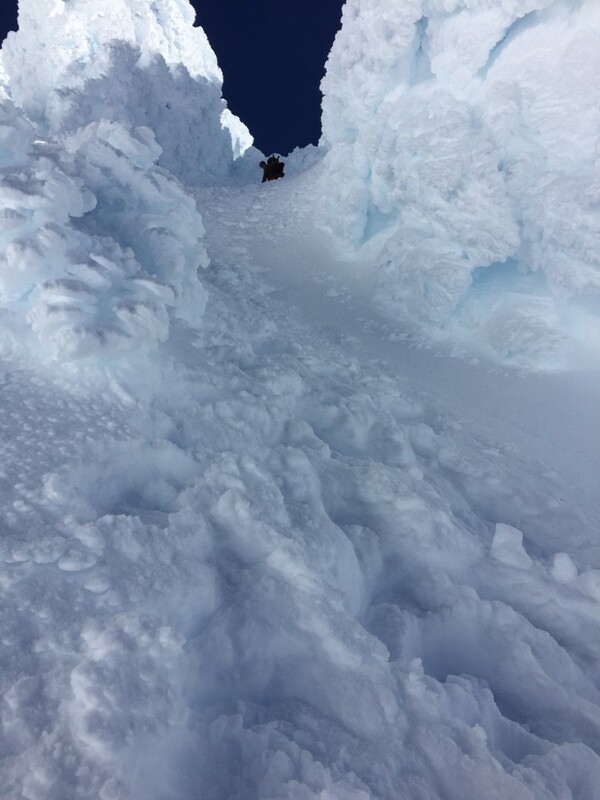 Crevasses can range in size – from a few inches to several feet in width and tens or hundreds of feet in depth. Crevasses form as a result of glacial movement and stress in the surrounding landscape. Crevasses can occasionally become filled in during the winter and gradually become more exposed through the spring and summer. On the south route the Bergschrund is the primary crevasse to navigate around, however other crevasses can appear above the Palmer during the spring and summer. Pictured to the right of the Hogsback ridge: Hot Rocks fumarole. An opening in or near a volcano, through which white hot, sulfurous gases emerge. These gases are warm and smell similar to rotten eggs. Lingering on or near fumaroles can induce vomiting and potentially death, due to suffocation. Mt. Hood is a living volcano with two active fumarole zones, Hot Rocks and Devil’s Kitchen. They are typically exposed year round. Move steadily through these areas. Do not stop to enjoy the warmth. An overhanging mass of hardened snow at the edge of a mountain precipice or ridge. They can extend up to 40 feet out over the steeper north face of the mountain. Standing on a cornice could cause it to release, sending it and you plummeting down thousands of feet. Cornices form by wind blowing snow over sharp terrain breaks, such as the crest of a mountain, where it attaches and builds out horizontally. More prevalent in the winter and spring. Keep a healthy distance from the edge of any perceived overhang on the mountain. Ensure you are roped to a stable anchor point that is not attached to any part of the cornice if travelling on or near one. A small avalanche occurred at this location along the north crater only few weeks after this photo was taken. An avalanche is a rapid flow of snow down a sloping surface. After being triggered, avalanches can accelerate rapidly and grow in mass and volume as additional snow and debris gets picked up in it’s path. Avalanches can only occur in standing snow pack – in other words a significant mass of accumulated snow. Typically due to a mechanical failure or structural instability of some kind. Causes can include: external movement (climbers, wind, earth tremors), temperature (ambient air, sun light), or significant snow / rain fall in a short period of time. Avalanches are more likely to occur when temperatures increase (9am to 1pm) and the snow begins to soften. They can also be triggered by your or other climbers. Avalanches are a very real concern on Mt. 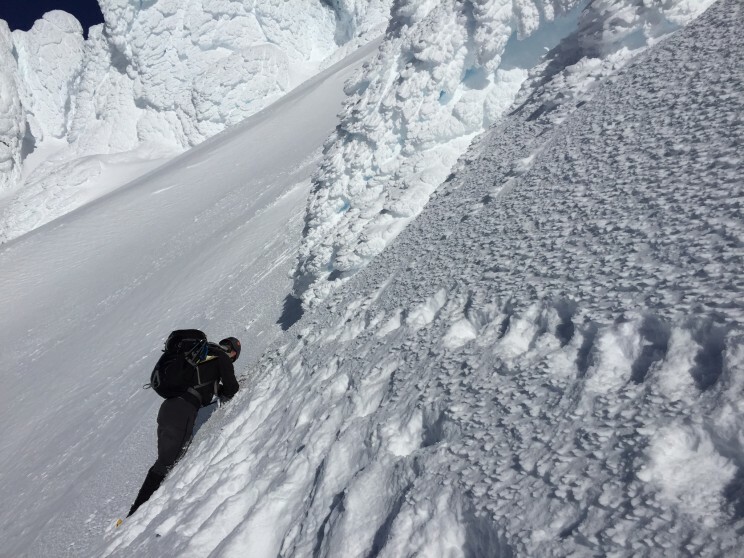 Hood – Each and every time a climb is attempted avalanche conditions should be assessed. 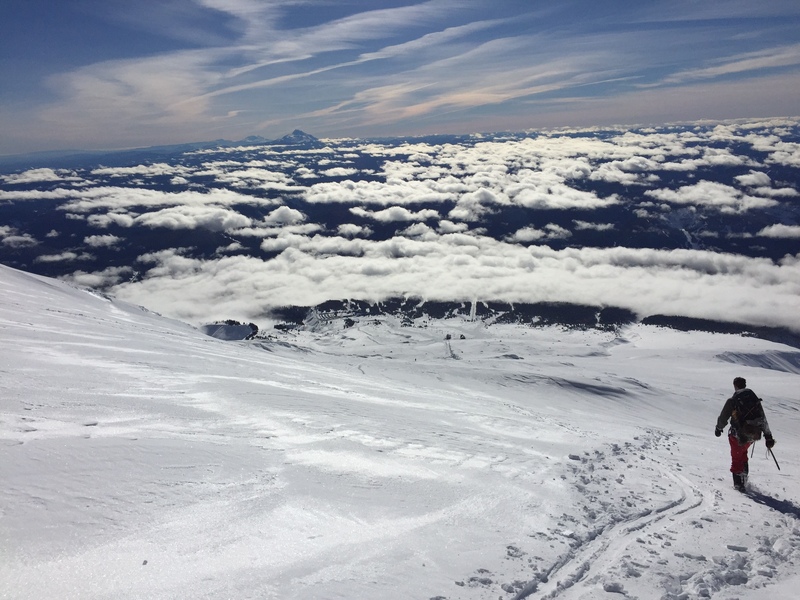 After any new snowfall in the spring and summer there needs to be 3-4 days with a combination of temperatures above freezing and sun radiation during the day, followed by temperatures below freezing at night, to stabilize the snow pack and minimize avalanche risk. That timeline can be shortened to 36-48 hours if there has been significant rainfall all the way up to the top of the mountain. 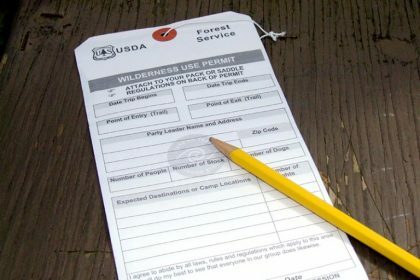 Entire courses are available through REI and Mountain Shop on how to identify potential avalanche zones and avoid them. In the event that an avalanche does happen and you or a fellow climbers are buried there are various pieces of equipment that can increase survivability, such as an avalanche probe, a shovel, avalanche transceiver devices, and an inflatable backpack . Queue up 'In The End' by Linkin Park. When you think you can eat seven cookies, but you can only eat six. Mt. Hood is sometimes characterized as an easy hike, or a “walk up” by some accounts, and while many inexperienced / ill equipped climbers are successful, this is not a climb for those lacking climbing experience. Inappropriate or the absence of specific gear required for a given situation will increase climber risk. Lack of knowledge on the use of climbing equipment increases climber risk. Lack of ability to properly assess a dangerous situation and/or potential risk increases climber risk. Underestimation is most likely to occur when climbers have neglected to thoroughly understand the risks involved with climbing Mt. Hood. Climbers should become as knowledgeable as possible about the route, conditions, risks, and up-to-the minute weather patterns on Mt. Hood prior to a climb. Constantly re-assess risk and perceived danger as the climb progresses. Proper attire & climbing gear, emergency equipment, backup plans with people not on the mountain. Climbers may pass you quickly, stop in front of you, fall and slide into you, drop debris or equipment, etc. – In other words – Despite your best efforts, other climbers must be taken seriously as a variable of risk. Improved weather during the Spring and Summer months attracts more climbers, especially to the “easier” south route. 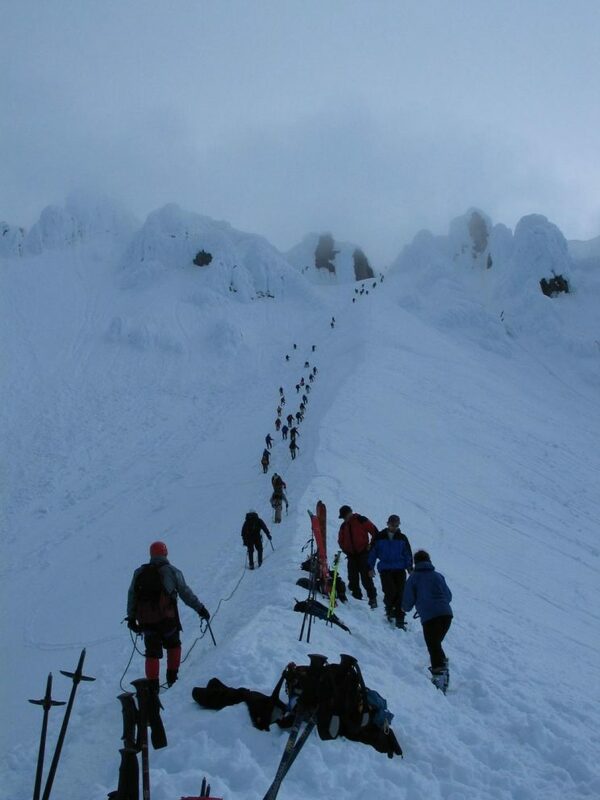 Whenever there are a lot of climbers together in a relatively small area there is the potential for danger. Spring and Summer seasons – especially from Memorial Day through July. Move quickly, carefully and efficiently through chutes. Yield to uphill traffic while descending. Wait behind slower climbers, don’t pass unless they give you the OK. Pass quickly and well to the side of other climbers / teams. Give other climbers and teams lots of space. Use: This is a general form stating the people in your party, planned route, climbing dates and emergency contact info. However, if you don’t come back on your stated date, don’t depend on this form to initiate a search for you. Climbing is a physically demanding activity, requiring proper conditioning and training. In addition to the strenuous activity of walking uphill with weight on your back, you will be breathing less oxygen due to the elevation. With less oxygen your muscles will be working at a diminished capacity. Before climbing Mt. Hood, you should go on several training hikes. 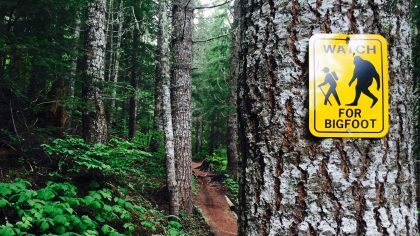 These hikes should consist of elevation gains of 3,000-5,000 feet and distances of 2-4 miles to simulate the slope of Mt. Hood. Locally these are climbs such as Mount Defiance, Table Mountain, Dog Mountain, and Hamilton Mountain to name a few. Climbing other mountains like Mt. St. Helens or Mt. 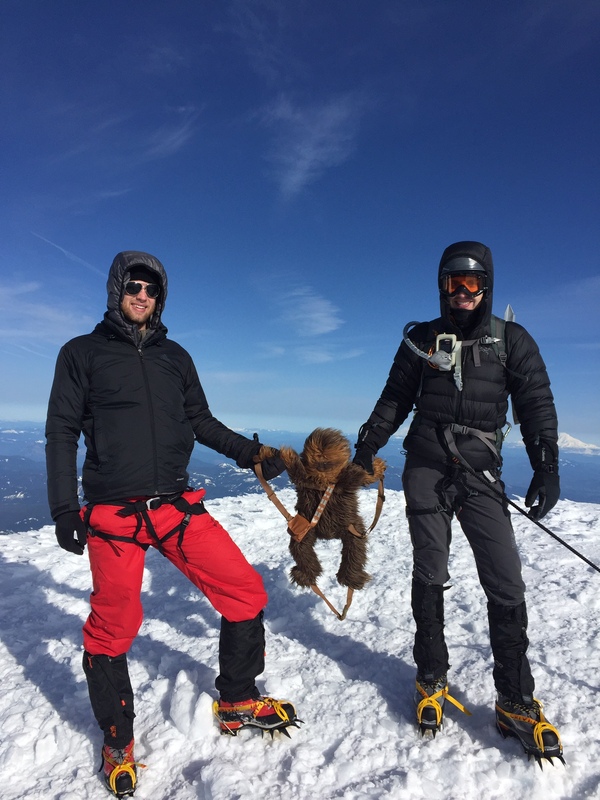 Adams will give you an idea of what it’s like to climb at elevation. During these hikes, if possible, carry the equipment you will climb with. If you do not own all the equipment you will need, put other items in to simulate weight. A pack of 20-30 pounds is average for a Mt. Hood climb. Photo taken December 2015 - We picked a day to hike to the end of Palmer Snowfield with low visibility and high winds to get a sense of what relatively bad conditions might feel like. A person who exercises regularly and is in good physical health should plan on doing 5-10 of these sorts of hikes before a climb. Those who do not get regular exercise or have other health problems should consult their doctor for an exercise routine appropriate for them, and slowly add in hikes with elevation and a weighted pack. Every climber should also be trained and practiced in self arrest and crampon techniques. These are skills you will need for the climb. It is also important that each climber is familiar with other skills that conditions may require, for example: belays, rope-team travel, crevasse rescue, avalanche condition assessment, avalanche transceiver use, first aid, navigation and rappelling. Remember that the safety of every climber on the mountain is at risk whenever a single climber is unprepared. 11:00 PM – Arrive at Timberline Lodge parking area (5,924′). Check in, organize gear and use the restroom. 12:00 AM – Depart the parking area. 1:30 AM – Arrive at Silcox Warming Hut (7,016′). Take a break, if needed, using Silcox Hut as a windbreak. 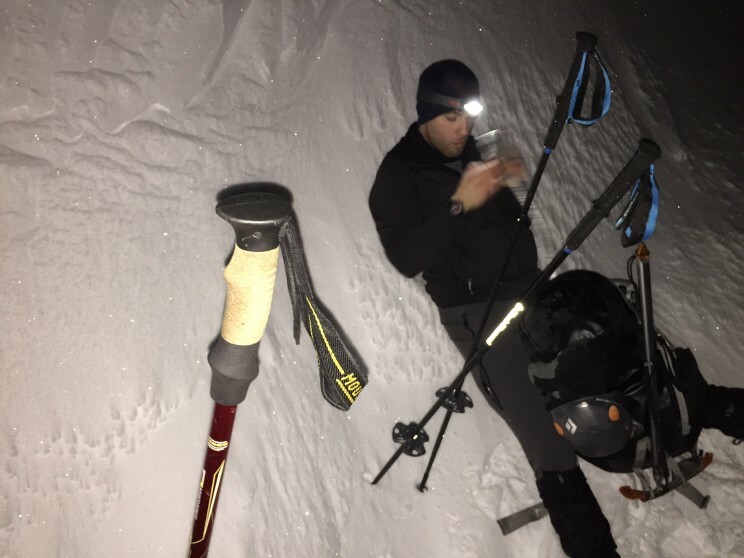 4:00 AM – Arrive at Upper Palmer Lift House (8,540′). Take another break, check weather and visibility. If either is poor consider waiting for better conditions, or turning around. 5:30 AM – Arrive at Crater Rock (10,524′). 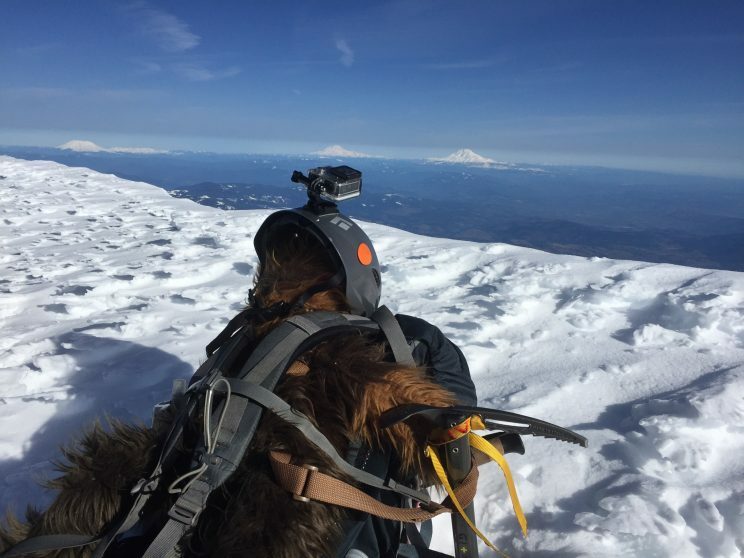 This is the best spot to put on crampons, harnesses, etc. It is also as far as you should go if you are not prepared for a climb. 7:00 AM – Summit (11,245′). Enjoy the views, a snack, a drink, take some photos, and turn around. 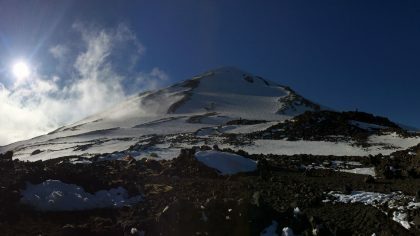 8:30 AM – Arrive back at Crater Rock. Take off your crampons, harness, etc. By now conditions are generally warm enough to not need crampons. Keep them on if you feel more comfortable. 12:30 PM – Arrive back at Timberline Lodge parking area. Take breaks at the Upper Palmer Lift House and/or Silcox Hut if you’d like. Mt. Hood climbs can take between 2 – 24 hours round trip, depending on your schedule. Most climbers want to be done in a day and, unless you are planning on setting a speed record, that means leaving in the early morning and returning in the early afternoon. Typically climbers leave the Timberline Lodge parking lot between 11pm and 2am. Someone who has prepared properly to climb can average 1,000 vertical feet per hour, at that rate it will take a little over 5 hours to summit. A start time should be established based on an estimated pace and your desired summit hour. It is strongly recommend that you summit no later than 8am to avoid peak rock and ice fall hours. If you are in good shape and have trained to climb Mt. Hood you can estimate 4-7 hours to summit. Other climbers should prepare for a longer climb, maybe 6 – 9 hours. If you are unsure of where to start, play it safe and follow the Magic Mile Ski lifts which start 100 yards west of the Timberline Lodge. They will guide you to the top of the Palmer Snowfield and end at the upper lift station. In conditions with good visibility you should be able to spot Crater Rock and head straight towards it, while veering slightly to the right. The route to get up to Crater Rock and the Hogsback will traverse the Triangle Moraine – crampons may or may not be useful here. Proceed quickly through the Devil’s Kitchen area and avoid breathing in the fumes. You should be able to visibly make out the base of the Hogsback where it conjoins with Crater Rock. Pearly Gates or Old Chute? The next phase of the climb typically comes down to: Pearly Gates or Old Chute? While resting at the base of the Hogsback you will have a chance to observe the chosen routes of other climbers and assess the risks involved. Ultimately, conditions dictate which route is best. The most direct route to the summit from Crater Rock is the Pearly Gates, however there is no guarantee that it can be safely traversed. Depending on the season and the year it can be a solid wall of ice. 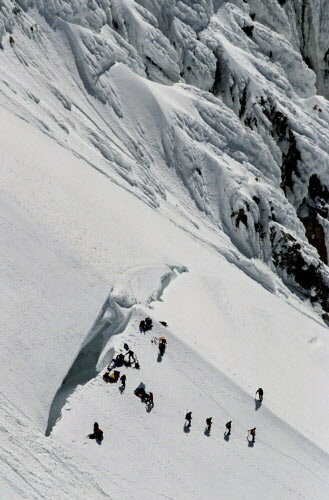 Unless ascending through the Old Chute, climbers must circumvent the Bergschrund. Although other crevasses can open up later in the spring the Bergschrund is a fairly consistent danger. The Pearly Gates themselves tend to be the steepest (30 to 40 degrees) section of the entire climb, and has the most danger of rock and ice fall. Proper climbing gear is required to navigate this route safely and decrease risk to yourself and other climbers. The Old Chute has a lot of the same dangers but is generally less steep albeit a longer traverse to reach the summit. If conditions are in your favor and all of the steps you’ve taken so far are successful you will be on the summit in a matter of minutes after passing through the Pearly Gates or walking along the summit ridge from Old Chute. 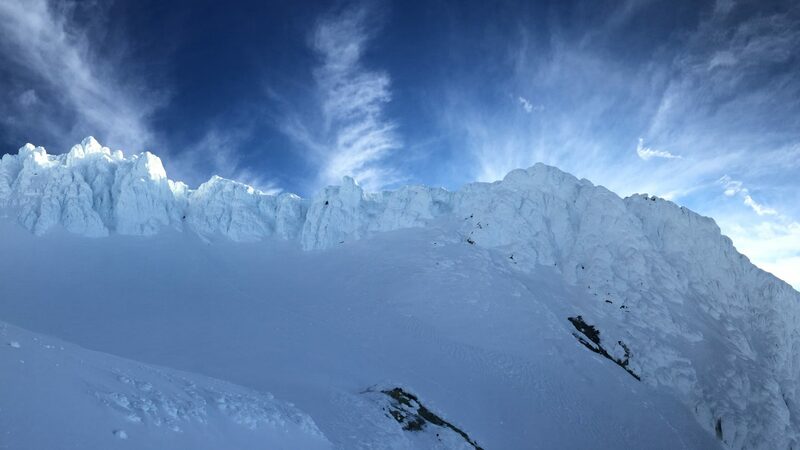 Unfortunately the danger does not cease once you make it to the summit as cornices, high winds, and freezing temperatures are often present. All that being said – allow yourself to bask in the glory for a minute before heading down. Descending from the summit to the parking lot will take you approximately half the time it took you to summit. If you reached the summit in 6 hours it may take you 3-4 hours to get back. Descending is a challenge in and of itself. You will be tired, and using a whole new set of muscles. But gravity is on your side, and there will be far fewer breaks (perhaps just the one to take off your crampons). Generally you should descend the route that you came up, however the Old Chute is usually the easiest route to get back down. Mt. Hood can be climbed any time of year, depending on your chosen route. However, climbers using the south side routes should consider climbing from mid-April to mid-July, depending on route conditions. 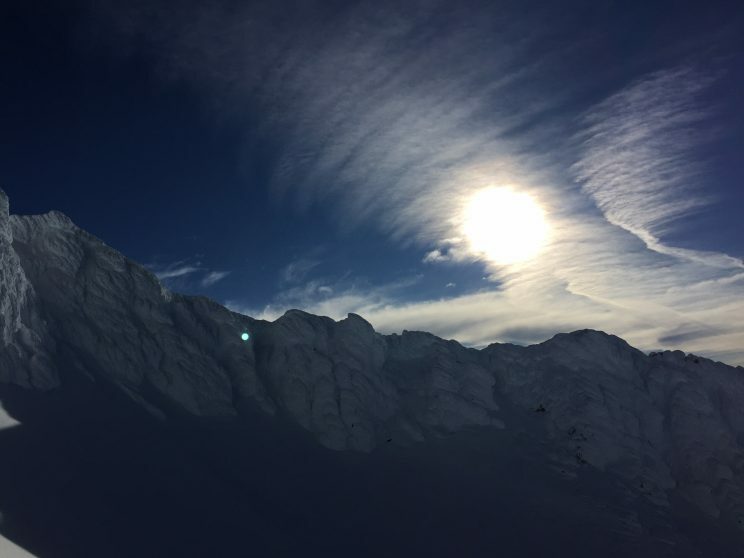 Earlier and there is an increased risk of avalanches; any later and there is an increased risk of landslides, rock fall, ice fall and open crevasses. Weather and mountain conditions should be the ultimate indicator of when to climb. Guided climbs are typically only offered during the peak climbing months between April and July. 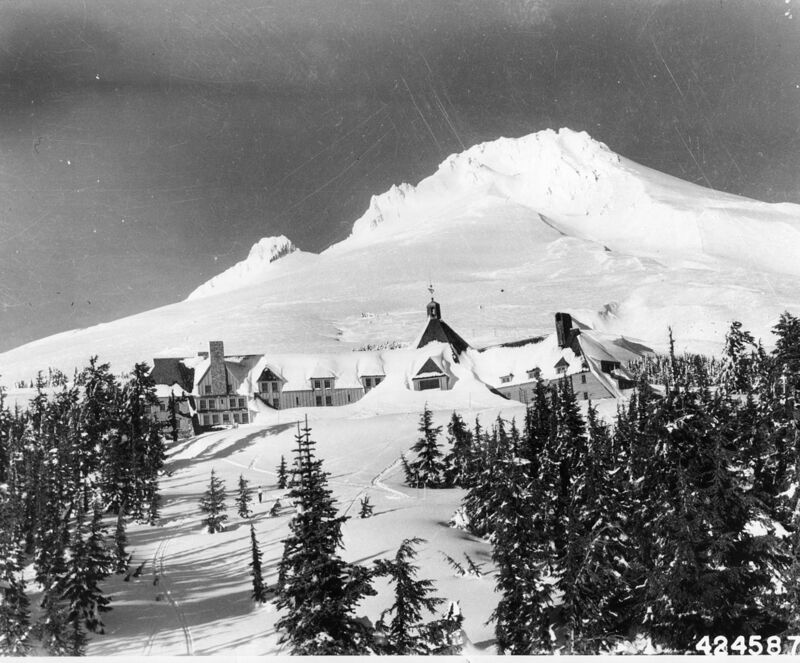 Mt Hood and Timberline Lodge, circa 1943. Climbers often stay in Portland and leave the city late at night for a climb. Portland offers easy access to hotels, the airport, rental cars and other accommodations. The drive to Timberline takes less than two hours (one hour if you’re a speed demon), so many climbers leave in the evening, arriving in time to organize and depart. Others prefer to stay in Hood River, which is closer to the mountain but a smaller city without a major airport. Hood River is a beautiful town with a strong outdoor-lifestyle vibe. If it works with your travel plans, Hood River is a great place to stay! Still others will stay at Timberline Lodge, while more expensive it holds a lot of history and is undoubtedly the most convenient lodging. A less expensive alternative, almost as close, is the Mazama Lodge owned and operated by a Portland climbing organization. There are also a variety of hotels, inns, and resorts in Government Camp, OR which offer affordable lodging. 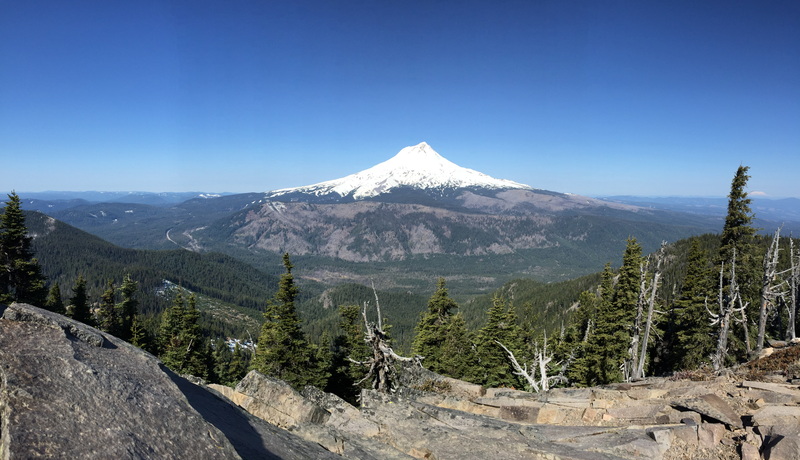 Most climbers choose to drive from one of the nearby towns or cities, but if you’d prefer to camp a bit closer there are terrific options in the Mt. Hood National Forest. If you’re traveling in an RV you have several camping options, including parking your rig in the Timberline Lodge parking lot. If you’d like a longer stay on Mt. Hood, you may also camp on the mountainside. If you choose to camp above timberline, be sure you are out of the ski area, be cautious of rock and ice fall, and know the avalanche conditions. Perhaps the safest (though not necessarily safe) place to camp is Illumination Saddle, about a 3-4 hour climb from Timberline Lodge. This small ridge between Castle Crags and Illumination Rock will deflect most falls to one side or the other, and the ridge itself isn’t likely to let loose. Starting from Illumination saddle drop below Crater Rock and rejoin the main South Side Route, it should take 2-3 hours from the saddle to the summit. Follow all the other guidelines for a south side climb, but adapt your timetable accordingly. We also recommend packing up camp and stashing your camp gear on the Hogsback to be collected on the way back down. We think this is better than reaching the summit and returning to the (out of the way) Illumination Saddle to pack and collect your gear, at that point you’ll be tired and want to get to the car. Why not pack up and haul your gear while your legs are fresh and your adrenaline is pumping? Most people start from Timberline Lodge. Your route to get there may vary. Oregon’s Department of Transportation is responsible for clearing public roads and parking lots of snow, including Timberline Lodge. Our required versus recommended gear selection is based on a well-rounded approach to mountaineering on Mt. 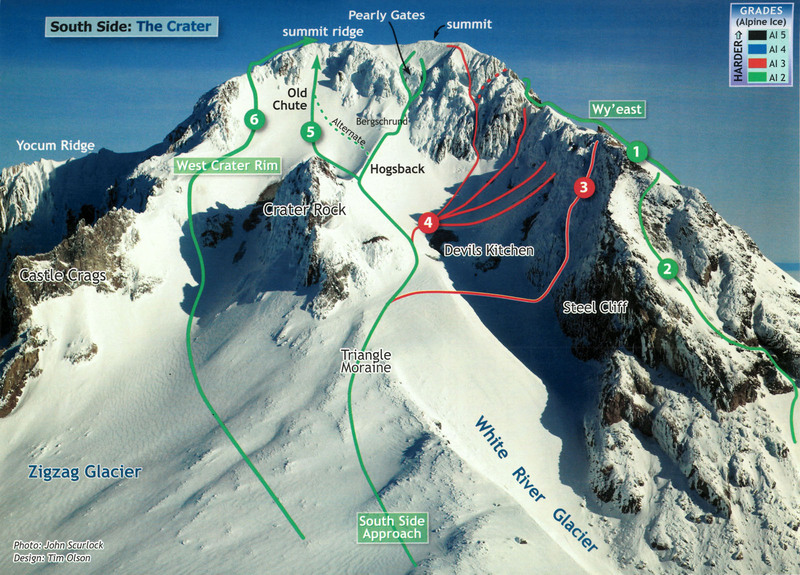 Hood’s south climb route that aims for the least amount of risk and while maintaining minimal weight. You should always evaluate what gear to bring based on current conditions and your overall risk comfort level. Superior quality gear will allow you to lean up against banks of ice and snow in the midst of single digit temperatures like your lounging at the spa. An improper clothing strategy on Mt. Hood can mean at best – chilly bits; at worst – limb devouring frost bite. The best approach for Mt. Hood is the 4-layer system: Base-layer, mid-layer, shell, insulation. Do not wear cotton – All layers should be either synthetic, wool, or another breathable material. Base-layer – Top and Bottom – This can best be defined as a long-sleeve compression shirt and synthetic leggings . Your base layer should allow for a great range of mobility, moisture wicking, fast-drying, and be ultra-warm. Mid-layer – Top and Bottom – Also known as the soft shell layer, this is the layer you should be able to climb in under ideal weather conditions. Similar to the base layer these items should maintain optimal breath-ability, heat/moisture dissipation, and retain adequate warmth. For example, this might be a fleece jacket and hiking pants . Shell – Top and Bottom – This is the layer you put over everything else. While it may not provide much insulation, it’s primary purpose is to keep wind, rain, sleet, snow, ice, and any other undesirable elements away from your underlying layers. An affordable shell layer might be the Adidas Outdoor Wandertag jacket and O’Neill Hammer snow pants . A shell layer with more advanced, light-weight, protective materials might be the Arc’teryx Beta AR jacket and Mountain Hardware Torsun pants . Insulation – This is your deep cold layer. It comes in to play when conditions start getting chilly or you are not moving enough to maintain a comfortable body temperature. This is typically a down jacket (aka the puffy jacket). We personally like and have used the Black Diamond Cold Forge Parka and the Arc’teryx Thorium SV hoody . Gloves / mittens – We recommend a fleece glove or liner paired with a deep cold mitten. In most conditions you will find that your hands retain quite a bit of warmth with a decent fleece glove and that the mittens function as a great backup for when the wind picks up or the weather degrades. Why mittens? Because by not separating your fingers from one another in a traditional glove they stay warmer by sharing their heat. The REI fleece grip gloves paired with the REI Deep Cold mittens are a fantastic combination in most conditions. A similar combo is offered by Outdoor Research with their fleece gloves and Meteor mitts . Hats – Fact: The majority of heat loss occurs through the top of your head. A wide-bill trucker hat may give you “bro” points, but it retains minimal heat. 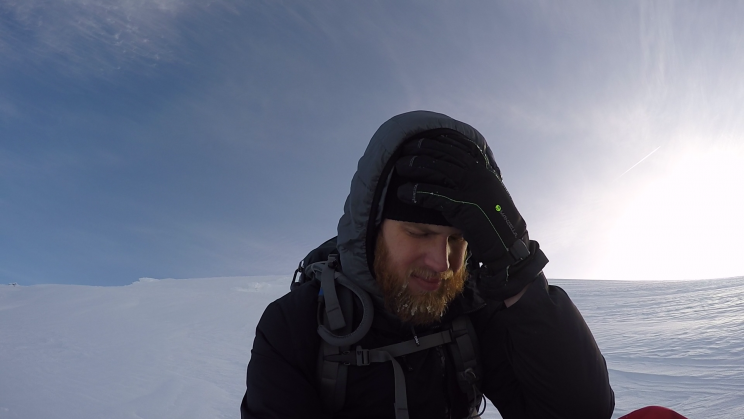 Beanies or other insulated head gear is the recommended choice. Balaclava – Not to be confused with the Greek dessert (baklava), a balaclava is like a ski mask which protects the exposed parts of your face to the elements. You would be surprised at how much of an improvement even an inexpensive balaclava will make in cold or windy conditions. Socks – Arguably one of the most important selections behind boots. Your feet will be taking a beating while climbing Mt. Hood and ensuring that they stay warm, dry and comfortable is a primary factor in having a successful summit. Long wool socks are highly recommended. 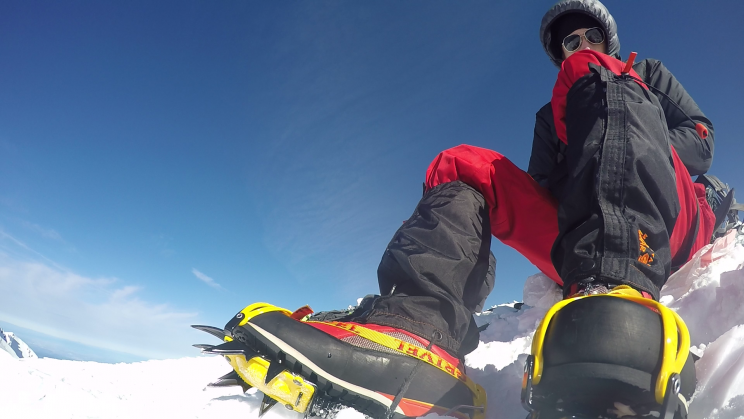 Boots – A quality pair of boots can make or break a successful summit attempt. Considering the amount of abuse that your feet will experience on this climb, selecting a boot that is both comfortable and supportive is crucial. You will also need a boot which is compatible with your chosen style of crampons. Crampons allow you to grip into solid snow and ice providing stability and traction when you need it most. While it is technically possible to reach the summit without crampons we would wonder why you would even take that risk. There are several types of crampons available on the market, but the key is matching the correct crampon binding system to your boot. In fact, REI has a great article describing how to choose the best crampons for your goals. We highly recommend you pick your boot prior to selecting a crampon because at the end of the day a comfortable, supportive boot is preferable to ill-fitting footwear that you’ve attached some spikes to. One pairing that we’ve had a lot of success with is the La Sportiva Trango boot and Grivel G-12 new-matic crampons. Grivel’s new-matic system has a locking point in the rear and straps in the front to ensure a secure fit to this style of boot. He burned off that Reeses' after reaching the top of the Hogsback. The short answer is: you will burn a tremendous amount of calories climbing Mt. Hood. Eat before, during, and after the climb. Load up on fats and proteins before the climb as these metabolize more slowly and will give you energy for a longer period. During the climb snack constantly on high carbohydrate foods as these metabolize faster and give you quick bursts of energy. Eating at least one or two snacks per hour avoids large spikes in energy and helps maintain smooth, consistent energy levels. Keep in mind, roughly 50-100 calories can be burned every 15 minutes depending on your base metabolic rate, speed, grade, and air temperature. In the winter, the body will burn additional calories just trying to stay warm. For a 9 hour climb that’s somewhere between 1800 – 3600 calories. That’s the equivalent of between 8 – 17 regular sized Snickers bars, which apparently you can buy in bulk . It’s also important to be aware that your taste buds may change as you gain elevation. Furthermore, altitude sickness may actually suppress appetite. In other words, if you only sort of liked a food at base elevation you’re probably not going to like it at high elevation. So bring foods that you know you’ll enjoy. I like sour gummy worms for high elevation expeditions. After the climb, have a burger, sandwich or something high in fats and protein which helps muscles recover from lots of exercise. Remember your metabolism keeps going for an hour or two after you stop, so that’s the time to binge a little. Even a Camelbak can freeze - be prepared with alternative hydration sources. Science recommends 1 liter of water be consumed for every hour of high energy activity. For a south side climb that would be 8 – 12 liters (or 2 – 3 gallons), which is the equivalent of 27 – 40 pounds of weight on top of all the other gear you would be carrying. Similar to food – we recommend the before/during/after strategy. Drink 2-4 liters of water a few hours before you start your climb to saturate your body and reach your muscles. For the actual climb, bring 2-4 liters of water to sip on constantly. 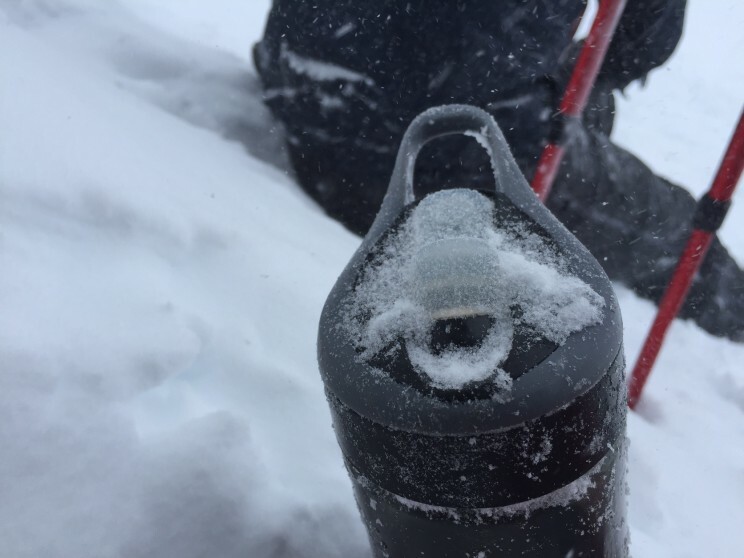 While a bladder makes constant hydration easier, we recommend Nalgene or Camelbak water bottles to avoid the scenario where your bladder hose freezes preventing you from drinking any water. If you do use a bladder, blow water back into the bladder to help prevent the hose from freezing or purchase a hose insulating layer. Another option would be to have a hybrid water bottle and bladder system in case either method fails. After the climb, have a gallon of water waiting in the car to replenish your reserves. Each climber should carry a medical kit from which they can dispense first aid to themselves or another climber, but you should never depend on another climber to be able to patch you up. Adventure Medical sells a great, light-weight kit that we bring on every outdoor trip. 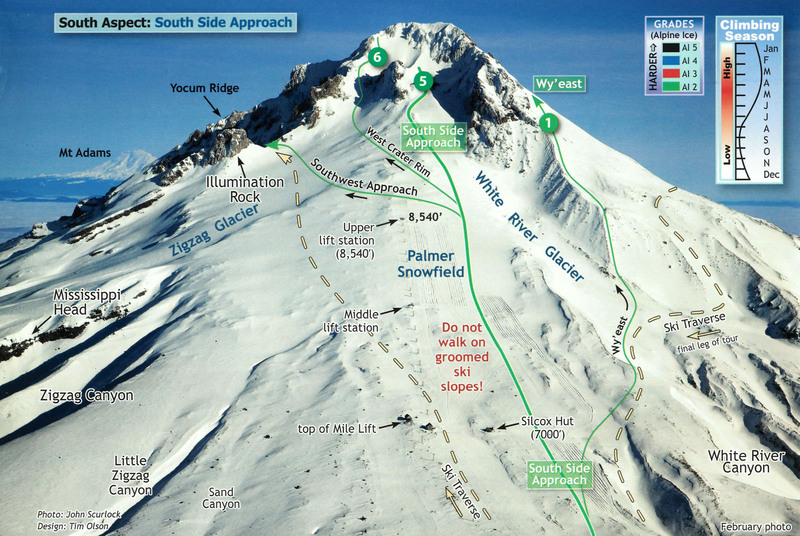 Under clear, optimal conditions Timberline Lodge will be within view 90% of the climb. However, weather can change rapidly and white out conditions can descend on the mountain much quicker than you can climb down. Having and knowing how to use a map, compass, and altimeter can keep you on course. The primary reason for packing a light-weight shovel is to decrease risk of death during an avalanche. If someone in your party gets buried you only have a matter of minutes to find and dig them out before chances of survival plummet dramatically. 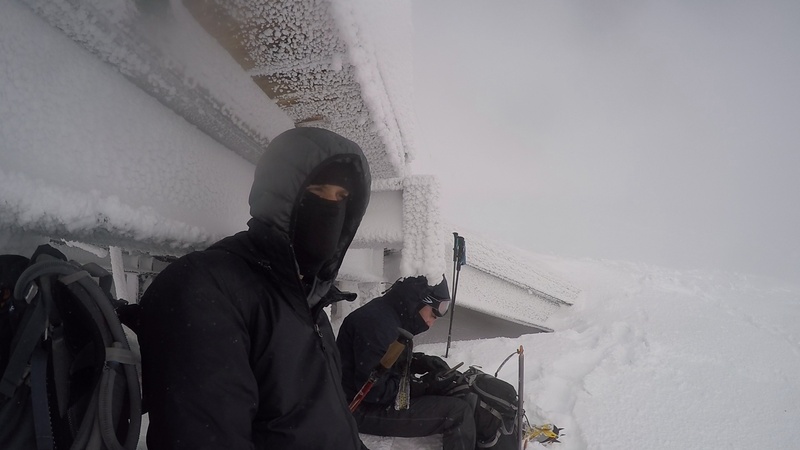 The secondary reason is to be able to dig yourself a snow cave in the even that bad weather moves in suddenly and you find yourself trapped on the side of the mountain. Here is a great reasonably priced, durable, light-weight, component shovel which we use. In theory, you could climb Mt. Hood in the middle of the night during a full moon and not need a headlamp. However, all other times you will. You will be starting in the dark, and you’ll want your hands free. A headlamp with fresh batteries is the best light source . A climbing helmet is necessary on Mt. Hood because of the significant ice and rock fall danger higher on the climb. Your helmet should meet climbing certifications, meaning that it is rated for impact from above. Biking and ski helmets are not suitable substitutes as they are only rated for side impacts. One of the best climbing investments you can make. Acquiring and carrying an ice axe is easy, but knowing how to use it requires skill, familiarity and practice in the art of self arrest. The South Side Route is not a technical snow / ice route, and so we recommend a straight (or slightly curved) handled axe. When choosing the length of an axe, stand up straight and hold the axe by your side grasping its head between your fingers. The spike (bottom) of the axe should rest by your ankle. A longer axe might be nice as Mt. Hood’s south side is relatively low angle (30 to 45 degrees). A shorter axe will require you to bend over to place it, a tiring endeavor. Also, a shorter axe may seem lighter but the difference is usually only an ounce or two. If using a shorter axe or ice tool look into a trekking pole for the other hand. Your ice axe may come with a leash. 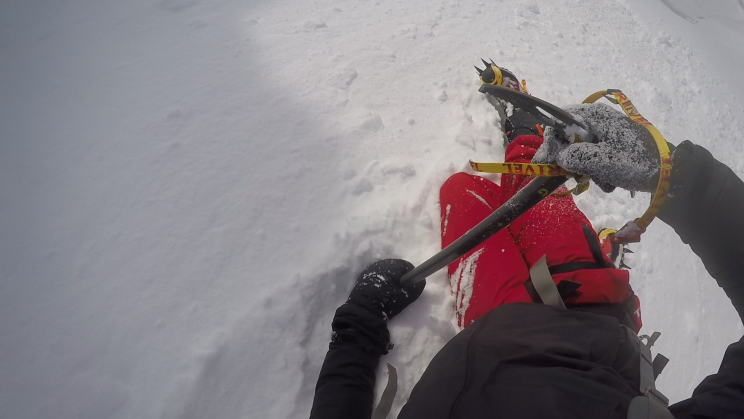 This is important in case you do go in to a fall and the ice axe leaves your hand. A leash keeps the ice axe attached to your person either on your wrist or climbing harness allowing you to reel it in and perform a self arrest. Gaiters cover the vulnerable tops of your footwear to fully protect your feet and lower legs from the snow, water, dirt and rocks that have a way of sneaking into even the best boots. While not strictly required for Mt. Hood we would never climb without them. Even a less expensive product like the Moutain Hardware High Gaiter offers superb protection in most conditions. "I also love my trekking poles." As we’ve lamented on other trips, trekking poles are extremely advantageous to have, especially on mountains. They do more than just provide stability. Trekking poles actually transfer load away from your legs. This is most noticeable on downhill sections where your knees are most likely to take a beating. An affordable pair of trekking poles will do the trick, however if you’re feeling the need to go ultra-light Black Diamond makes a carbon fiber trekking pole . We like and have used both, but the Black Diamond product is mind-bendingly light and strong. Taken on Jan 2016 at 9:31am at the Hogsback. At elevation there is less atmosphere to protect your skin from the sun’s harmful radiation. Combine this with the reflective properties of snow and you can get a fairly severe sunburn without the proper protection. Having a strong sun screen (SPF 40+) or a hat that shades your neck, face, and ears can prevent this. It’s also easy to forget that your lips need protection too. Having lip balm with an SPF rating can go a long way to avoiding puffy, sun-burned lips. Wear sun glasses to protect your eyes as soon as the sun rises. Most people will be carrying their cell phones when they climb so that they can snap photos of their adventure, but these devices can also serve as locators for lost climbers. In the days prior to wireless phone technology it was common to purchase or rent an avalanche transceiver or mountain locator unit (MLU) which could be used to locate a person in the event of an avalanche. More advanced devices like RECCO reflectors, PLBs, and SPOTS are now available which use GPS and two-way satellite communication to provide emergency personnel with more accurate information about your location. Additional information about the advantages and disadvantages of these devices is available here. 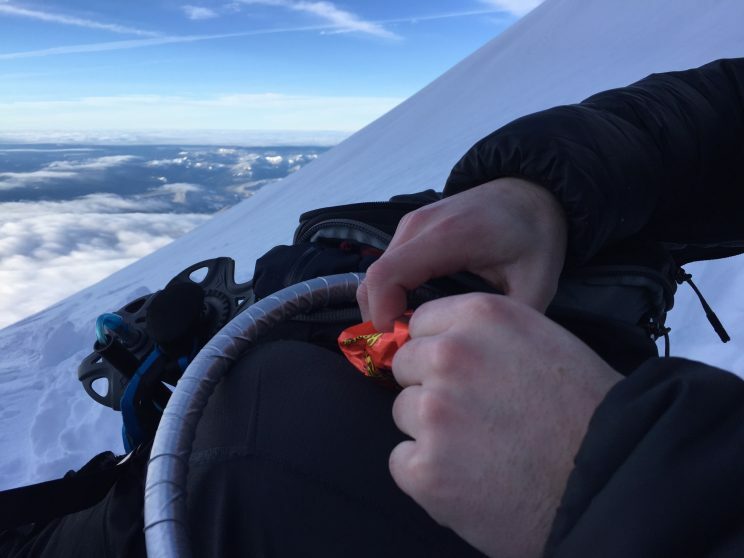 Avalanche beacon – Each climber should be equipped with a beacon so that they can be discovered in the event of an avalanche. Many devices, like the Backcountry Access Tracker , act as both a transmitter and a receiver- also known as a transceiver. 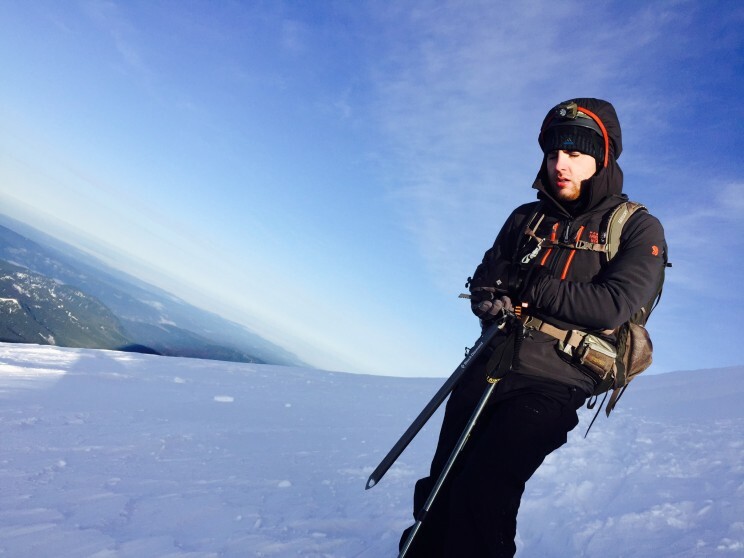 Avalanche probe – Similar in design to a trekking or tent pole, an avalanche probe is used to poke the snow to discover where a buried climber or object might be. Shovel – Carrying a light-weight utility shovel allows you to dig other climbers out if they become trapped in an avalanche. We like the Yukon Charlie sport utility shovel for its compact, componentized-designed, durability and light weight. Avalanche backpack – Like a regular backpack except these contain airbags that, when triggered, inflates the airbags and helps you float on top of the avalanche to greatly reduce the probability of being buried. There are scenarios where climbing gear is required on Mt. Hood’s south side routes. Crevasses, steep slopes, and risk of falling necessitate proficiency in roping up, self arrest, crevasse rescue, setting anchors and rappelling. Although generally not needed until reaching the Hogsback, we recommend bringing climbing gear so that your team can safely ascend the last 1,000 feet to the summit. Climbing Harness – A climbing harness attaches around your waist and legs, becoming the attachment point for roping up to a team. It can also double as a gear carrying device. A climbing harness is required to rope up to a team. Climbing Rope – Tied in to the climbing harness, the climbing rope should be chosen carefully as it is the connecting device between each climbers and is your safety net in the event of a fall. A 40 – 50 m dry rope with a diameter between 7.7 and 8.2 mm should be sufficient for Mt. Hood’s south side routes. Carabiners – A minimum of 1 locking pear-shaped carabiner for belaying and 2 non-locking carabiners for clipping anchors. We like to carry 3 locking carabiners and 2 non-locking clip carabiners for basic climbs. Pickets – Ice or snow pickets are used as anchor points to rappel, belay, or perform a crevasse rescue from. Ice Screws – These act as more secure anchor points that can be screwed into hard snow or ice when a picket cannot be placed reliably. While most people plan a south climb of Mt. Hood as a day trip, it is possible to turn it into an overnight expedition. Tent / Shelter – A four season tent is recommended, however in very good weather conditions a three season tent will pass. Sleeping Bag – A 0 – 20 degree bag will work under most conditions. Sleeping Pad – Having an insulated sleeping pad is required in order to get your sleeping bag and body from being in contact with the snow and ice. Do not expect the tent floor to be sufficient thermal insulation even on a four season tent. Stoves are useful for cooking warm meals and boiling water. There are many options available. Blue bags are provided for free at the climber check-in. They are used for solid waste disposal. All climbers should have a plan in place for emergency situations. This includes a plan made with a friend or loved one who is NOT climbing, and a plan for the climber(s). With this information in place, the individual you leave it with will know when to expect a phone call, when to worry, who to call and what to tell them. We recommend you pick a time you will check in with your friend/family member that is 1-3 hours after you plan on returning to Timberline Lodge. This way you have flexibility for any delays. Your search initiation time should be 6-10 hours after you were suppose to check in. If you do use this kind of plan DO NOT FORGET TO CALL, even if you are off the mountain safely, call. If you are running late, call. If you blow off the climb and go to a bar in Government Camp, call. What if a storm moves in? What if we get lost? What if we are behind schedule? What if the route conditions are questionable? What if someone is fatigued? It is vital that every member of your group agree on an answer to these questions. During a climb, ego and adrenaline are high and decisions can be rash. Discuss possible scenarios before you leave and come to a consensus. These are problems best solved in the parking lot, or better yet the drive up. Of course, there are a million things that can happen in a million different ways. You must be able to asses the situation and make good judgements, often on the fly. **Note: Experience is not the sole determining factor for a successful summit. This dormant volcano stands 7,000′ higher than any other peak within a 70 mile radius. 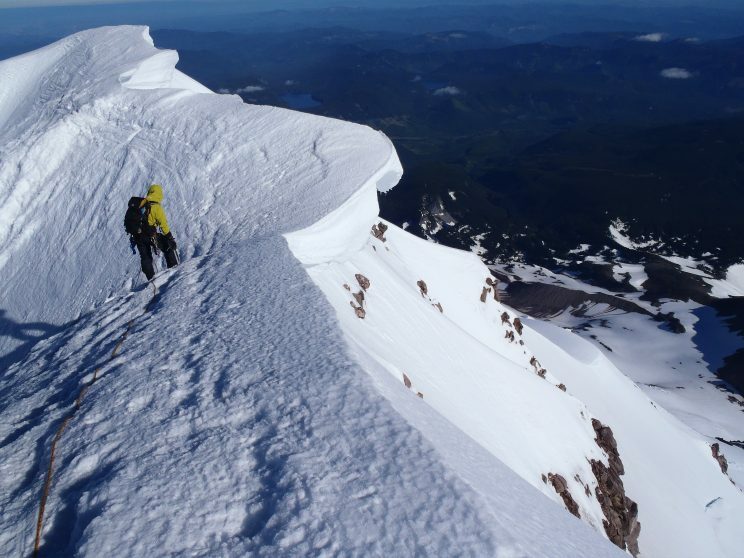 Its icy summit (11,245′) is the highest point in Oregon; making it a prominent, symbolic landmark and one of the most coveted climbing achievements in the Pacific Northwest. 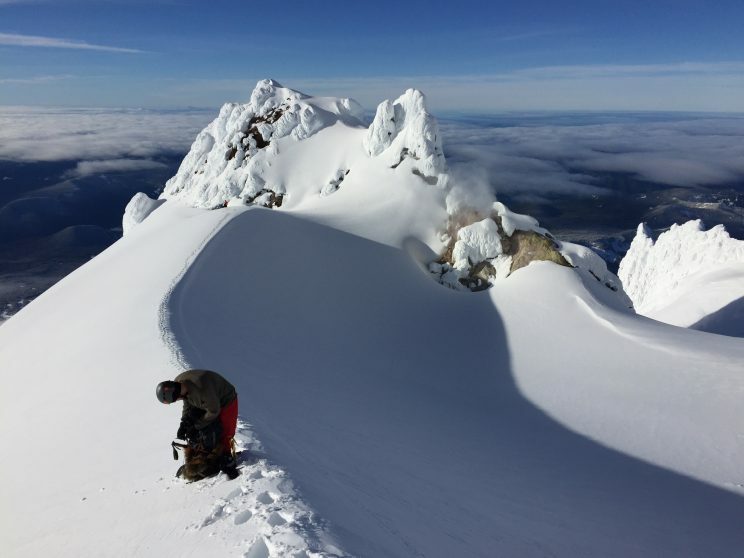 15,000 – 20,000 summit attempts are made each year, most of which start from Timberline Lodge and follow the south climb route. Having made numerous summit attempts, researching long hours into the night, and speaking first-hand with other climbers, our goal was to put together a guide for the south climb that was as simple and easy to absorb as possible. It was designed for both experienced and novice climbers; for the individual who wants to be equipped with as much knowledge as possible without having to bounce from site to site piecing together the bread crumbs to make a pie of knowledge. This is the guide we wish we had before our first Mt. Hood climb. If there is avalanche danger, you need to bring an avalanche beacon, a shovel and a probe. Just a probe would be useless. Good tip, Ryan! It’s ideal to have all three items on a climb when the avalanche danger is high. 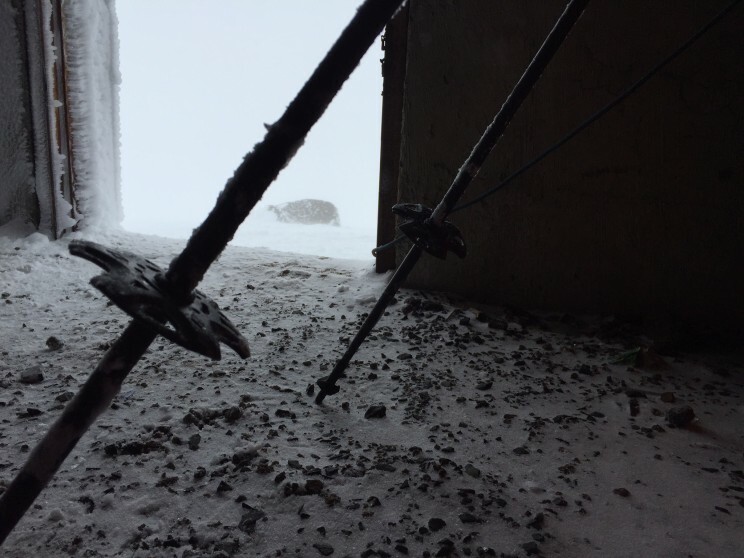 Not just when avalanche danger is high….whenever there is any avalanche danger at all. Thanks – Article has been updated.